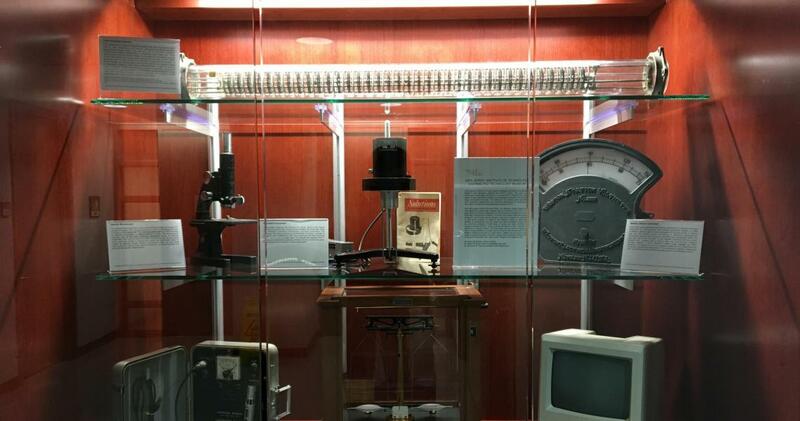 NJIT Distributed Technology Museum’s first 7-piece exhibit displayed in Fenster Hall. The project, started by NJIT professors Robert B. Barat and Elizabeth R. Petrick, is set to expand to various display locations across campus and aims to provide NJIT students and visitors with places to learn about how science and engineering research and education were conducted in the past. The 7-piece exhibit also offers visitors historical descriptions and informative contexts for each artifact in the collection to further illustrate the history of diverse research and education at NJIT. With support of the NJIT Provost Office, the museum project launched as an interdisciplinary collaboration between faculty members in the Otto H. York Department of Chemical, Biological and Pharmaceutical Engineering and the Federated Department of History. However, inspiration for the idea first came about when Barat, professor of chemical engineering at NJIT, took it upon himself to start finding and saving historical equipment on campus that was being scheduled for disposal. The initiative has received diverse donations from alumni and independent researchers, as well as NJIT’s physics, chemical engineering, mechanical engineering and computer science departments. The highlights of the next collection include a historic dynamometer displayed with the assistance of a special 3D-print stand designed by NJIT students. The project, undertaken by professor Murat Guvendiren's Introduction to 3D Printing class, gave students the opportunity to work in teams as part of a contest to design and build their own stands in NJIT’s 3D print lab. In total, students of the class created a selection of eight stands for consideration. In the end, however, it was a group of three chemical engineering undergraduates — Ashton Tatka, Ruqayyah Tahir and Wilson Melendez — who devised the winning design that will now help hold up the dynamometer in the next exhibit. Negotiations are underway to provide campus space for the next exhibit and expansion of up to two more museum displays. Petrick says the displays will eventually be connected with other existing exhibits across campus and could eventually be made into a “digital museum” for visitors to view online.